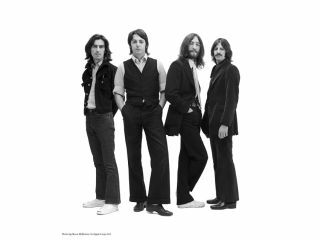 The Beatles on iTunes: do you care? The Beatles: now available in a compressed audio format. While some of us were dreaming of streams and clouds, Apple had its eye on Strawberry Fields. Yes, the big iTunes announcement is that The Beatles' back catalogue is available to buy in a downloadable format for the first time. While this is undoubtedly significant news - and because they're now all available to buy separately, raises the possibility of The Fab Four's songs appearing in the singles chart once again - it's debatable whether this will really go down as the 'day we'll never forget' that Apple promised. Let's face it: most Beatles fans already have the band's music on their iPods because they've ripped it from CDs. As such, the only people who really stand to gain from this long-awaited distribution deal are those who want to pick and choose their favourite Fab Four tracks. What's more, MusicRadar's resident Beatles obsessive Chris Vinnicombe notes that "While this opens up The Beatles' back catalogue to a new generation of legal downloaders who don't know what it's like to walk into a record shop and purchase a physical disc, the absence of mono versions of the early albums on iTunes is a pretty serious omission. "The absence of mono versions of the early albums on iTunes is a pretty serious omission." "For the most part, the hard-panned stereo masters of Please Please Me, With The Beatles, A Hard Day's Night and Beatles For Sale sound hopelessly dislocated on headphones, and this is surely the way that most digital downloads will be experienced. The magical power and punch of the mono masters is the true sound of the early Beatles, but to hear it now you'll have to either buy an expensive box set or a pre-2009 CD. "Listen to the differences between the remastered stereo and mono versions of Baby It's You for yourself." MusicRadar's US Editor Joe Bosso - another Beatles fanatic - is similarly disappointed: "Having just checked the iTunes Store, I was somewhat shocked to discover that the Mono Masters set isn't for sale. This is especially surprising since the band gave much more time and care to the mono mixes than they did the stereo releases. The group members would routinely show up at the mono mix sessions; the stereo mixes... not so much. For purists, and even non-purists but fans who want to really investigate The Beatles, this is a big negative. "Why would the inclusion of the Mono Masters set not be part of the deal? Surely, Steve Jobs could sell a few hundred thousand copies - and it's an expensive package, to be sure - and be happy with that. And then the world would get to experience The Beatles in the appropriate - and, no doubt, intended - manner. To not give the public this important option is kind of weird." Apple is rightly proud to have The Beatles on iTunes, then, but we're struggling to get massively excited about the news. Perhaps we're in the minority though: what do you think?